The very top of the hill is not shadowed by trees or buildings, meaning the sun will start to melt the ice first there. The water will run downhill, get to a more shadowed spot and freeze. The gritting sand sinks into the ice (or gets covered by ice) and the frozen run-off is really smooth. Very slippery! Who's most desperate for summer? The long winter here in Very Northern Florida means that many outdoor sports/hobbies can not be done all year around. People either put them on hold and do something else, or do the winter version. Anglers go icefishing etc. Gardening season is about to begin. Although there is still a lot of snow on the ground and it'll be May before the ground thaws, keen gardeners are already growing plants needing long growing season indoors. Once the weather gets warm, they'll replant them outside. Sailing on a regular boat is impossible when the sea is frozen. Boat owners can spend the winter fixing the boats, if they do not want to try ice-surfing or kite-skiing. One can only imagine how eagerly they wait for the ice to break and weather to get warmer. Another hobby that is pretty much limited to the summer is golf. The regular golf courses are under the snow, so they'll have to practice their swing indoors or go outside to play. There are some winter golf courses in Finland, and one is right outside of Oulu, out on the ice of the sea. So not all people walking around out there were ice fishers. Bright red/orange balls recommended, if you want to find them again. The 'green' is called 'white'. Their bikerack is under the snow, so park anywhere you like. full of frozen grooves, four inches deep. Very nasty! Now, as the topic says I fell today. For the first time in several years I fell so bad that my knees hit the ground. I've had to touch my hands on the ground sometimes to avoid falling over completely, but today I really fell. I was cycling on the street (crossing it) and I was turning left. There was some black ice and whiuuu- the bike went right and I continued straight on my hands and knees. I slid on the icy street a little, the bike was not damaged and I didn't even get my clothes torn or even noticeably dirty. Here's a picture of my naked knee- just to show that it really happened. As you can see, the skin is slightly red where I scraped it. Terrible, isn't it? I was biking home from downtown when I noticed something that I decided was worth stopping and taking a picture. Oulu is a coastal city and so we get enough wind for windmills. There's even one big one built quite near the city center. It's rated 3MW, is 90 meters high and the wings reach 135 meters. The first photo is taken near the city library, on one of the bridges crossing the river. The Windmill, about 3 kilometers away as the crow flies. I had some free time and the weather was great, so I decided to go closer and get more pictures of this landmark. The wind mill is on the southern end of an island, so I crossed the river. I found one road which went towards the windmill. All went fine until I came to a gate. The south end of the island is also harbour area and has restricted access. The road was blocked by closed gates and nobody seemed to be around to let me through, so I had to return and try another route. Which was a recreational path on the sea side. Too bad it has no winter maintenance. There was a path made by walkers, and I cycled on it until there was a camp site. A lot less people walked on after the camp site so the path was uncycleable, even with a mtb. The path and the camp site is very close to the coastline. From where I'm standing, it was maybe 40 meters to the sea. I'm maybe a kilometer from the windmill, but the trees block the view. If I walked out of the woods on the ice, I'd have a better view. But as I said the windmill was on the south end of the island. That also meant the windmill had the sun behind it, and with the white snow reflecting the sun it was impossible to get scenic shots of the damn windmill. So the first picture was the best one. On my hunt for the windmill I noticed someone kite-skiing out on the sea. Basically you have a kite or parachute like thing, and the wind moves you on skates or skis. Looks like fun. The small black speck on the center of the picture is the kite. The people who came to get their fresh air at the sea side paths or on the ice, got there by car! Well, lets hope they were from further away, not neighbours too addicted to the cars. To be honest, there were a few families with small kids with them out at the camp site. Also I dont know how much gear a kite-skier has with him. But I saw one ice fisher on his bicycle on the way home, he had the big ice drill and all the gear with him. On Saturday I noticed a norwegian bus at the parking lot of the local sport field. It's close to the bikeways, and can be seen in the comparision video. I got curious and went to see what was going on. In winter, the field serves as a skating ring. I had thought it was mostly used by kids playing ice hockey, but this time the users were speed skaters. The weather was not the very best, as it was snowing, but at least it was not windy. The event was Barents Match, Barents area championships. Well, I can tell you they were fast despite some snow on the ice. I decided to show some shots of bike parking. I'll admit, I shamelessy steal the idea from my other reader, Ms. Ding. But if she blogs about it, she must like the subject. And if I blog about it, I know that at least 66% of my readers will like it. As you know, I have 3 readers: me, Ms. Ding and the chair breaking vandal. It's easy to please an audience when there's not too many people with differing opinions in there! This spectacular bike was in front of the city library. The naughty cyclist did not park his bike properly! I wonder if he could get both front wheels to fit into the grill... maybe park backwards? Look at the row of parked cars in front of another supermarket, and the empty bike rack. Here the snow plow man has done his job well, and even cleaned the racks. Do the cyclists show they appreciate his effort? No. Those ungrateful cyclists demand parking, and then they do not use it. Well, they do not use that rack if there is empty places closer to the door. As everyone knows, transport cyclists are lazy. They do not want to walk any longer than necessary. That's what they have their bikes for, to avoid walking. This cyclist, who might even have a child with him, can get to the front door with about ten steps. For a small kid that is about 20 or 30 steps. Now think how many steps the kid would've needed to take from the rack shown in the other picture. Hundreds! All that wear and tear in the knee and hip joints from excessive walking has been avoided by cycling closer to the door! Last week the weather was sunny and warm, so the sunny parts of streets which have the most traffic were almost ice free, and even bikeways had a few ice free spots. This also meant that some of the ice turned into slush which then froze. In the photo you can see there is some uneven, icy surface. But the tracks are just a centimeter or two deep, so it's quite cycleable. Wide tyres recommended, though. Then the weather changed a little and we've got snow on several days, about 20cm altogether. On friday, it snowed wet snow and the wind was rather strong, so the snow blew sideways. One side of the trees got a white covering. I did not want to get snow in my camera, so I did not take a shot in the opposite direction. Today it was a few degrees Celsius below freezing, so the snow was fluffy and the wind blew it around nicely. The wind shook some snow off the trees, and it floated over the bikeway. The scene was quite idyllic. But, as I was cycling, I did not have my camera ready. I stopped and waited with my camera ready, but the scene did not repeat. You can see the snow in the air behind the cyclists in this badly cropped section of a photo. It was like that all the way to the traffic lights. Very pretty! Oh, and note how there's a > shaped area which has more snow? This is shot at a four way intersection. The snow plow came from where I'm standing, went to the right, came back and continued forward. As the snow is still falling, the snow plow men are quite busy. I cycled a short section on a street today, and it was much worse to cycle on than the bikeways. On the street there was about an inch of "fake packed" snow. It was really nasty to cycle on. In the center of the car tyre track was a very narrow (like two inches) section of packed snow. Off center, the snow crumbled and my bike slipped off the tracks, so I had to keep correcting all the time to keep my balance. I did not take that route on the way back! I was recycling the newspapers and noticed an interesting article in one of the old papers. It says "In the last three monts (November, December and January) heavy goods vehicles and lorries are involved in more than half of crashes with fatalities." It's not that the lorry drivers are causing the accidents, it's the fact that the vehicles are big and heavy. They're not as agile as cars, and they do more damage in a crash. They've even got an 80km/h speed limit to reduce the damage. "About 80% of HGV/lorry drivers are speeding." Spring break in Very Northern Florida! It's spring break here in Very Northern Florida. So I've been been busy breaking springs, and couldn't come up with anything useful to blog about. Although we call it "skiing holiday". The weather has been around freezing, I think that is a bit warmer than normally. The ice on the roads and bikeways has melted fast on sunny spots. But, winter strikes back. Today it snowed about 5 cm, though it's not very cold. -10C expected for the weekend. No girls in bikinis in our beaches, yet. The radio reports that the ice on the sea outside Oulu is about half a meter thick. Only big ships can move, and only with the help of icebreakers. But, as the spring moves on, the ice becomes more porous and fragile. That does not stop the ice fishers, as the weather is at it's best right now for them. The ice is still rather strong, and the sun is shining warmly. Later in the spring, the ice in the lakes starts melting from the shores, and in the middle of the lake it is still strong to hold. That makes some interesting fishing trips, I can tell you. The Finnish Association for Swimming Instruction and Life Saving published a report that for the first time since 1997, nobody drowned in February. In January there were three fatalities, all people who were on the ice with motor vehicles (an excavator and a snowmobile, for example). I think there may be a few ice fishers who will 'take the hook and sink'. But most drowning fatalities happen in the summer, and many involve exessive amounts of alcohol and a swimming trip. The authorities always hope for a rainy and cold weather for the Midsummer Day Holiday, as people are less likely to go swimming when the weather is nasty. And to tie up this useless post with cycling, I'll finish by saying that last year, five times more people drowned than were killed on bicycle. Where are the mandatory life vests for swimmers? Edit: all text was in bold. I uploaded a new video to youtube. 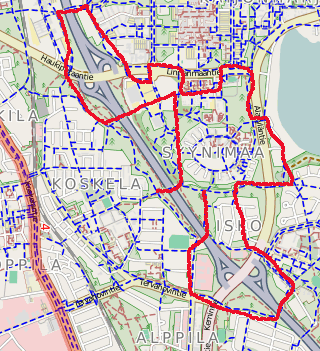 It shows the same parts of the bikeways in October, November and March. I do have some video from December, but it was too dark for the camera so it's so blurry that I decided to not use it. In January and February I did not even bother to try videoing, as it was too dark and cold for the md80. Why is that video in so small window? How do I make it bigger? In the October parts you can see me cycling over the frozen puddles. I guess it was the first ice of the season. :-) The route shown is one of the possible routes between the university and downtown. It's also the route I use when I go shopping in a shop east of the university. I finally figured how to get the video done. At first, Cinelerra could not open my files. I ran them through avidemux, then Cinelerra could open them. Then I found I could not get Cinelerra to do fastforwarding easily. Fastforwarding was a piece of cake Kdenlive, but it could not reverse a section of video. More avidemuxing. Then it worked! The whole video is on fast forward, so if you want a better look at something, you'll need to pause the video. This is my first upload to youtube, and I added some caption thingys there. I hope it still works! Link to youtube, you'll see it bigger there. As a followup to my previous post about bikeways in winter, I took some photos of what the conditions are at the beginning of March. There's been a couple of days with temperatures with daily highs above freezing (as in +1C or +2C when the sun is shining). One can really feel the spring is coming. Wearing the fur hat is unnecessary, water is dripping from the roof, trees are clear of snow and the first birds are singing. As we know, the cars make ruts on the road, and the ruts are first to clear. The cleared pavement is dark, and absorbs more heat from the sun. So roads are the first ones to be clear of ice. You can estimate how busy the road is based on how soon it's ice free. On this same intersection, the street looks pretty much the same as in November. I have a shot taken in January, and you'll see it's almost completely covered ice. A couple of inches of ice on the sides. On bikeways, the process is a bit slower. I noticed that I could see the paving in one part of the bikeway, where the maintenance crews had scraped all the snow away, all the way to the paving and the sun got through. This is on a south side of a hill, so it's one of the first places to be snow free. Once there is ice-free pavement, the sun heats the surface so the melting will spread out fast, if the melt water runs off the bikeway. If it doesn't, the water will freeze during the night and the progress will be much slower. There will be winter on this bikeway for a while. These bikeways are about the same as they were in November. The snow banks are higher, but the conditions for cycling are about the same. When the days will get warmer, the top of the ice will melt and then freeze during the night. So the bikeways will be more slippery and full of slush and frozen tyretracks, and the worst biking conditions of the year are ahead.